In contrast to the ban on U.S. and Russian intermediate-range missiles, "remaining outside the pact has allowed China to rapidly expand its missile arsenal as part of a military strategy designed to counter U.S. and allied military power in Asia," states a staff report by the U.S.-China Economic and Security Review Commission made public this week. "Implicit in this position is a recognition that limits on the United States and Russia that do not constrain China advantage Beijing," the report says. Disclosure of the INF report on China comes as Beijing for the first time disclosed the mobilization and test firing of one of its newest intermediate-range missiles, the DF-26, on Jan. 9. China has dubbed the missile the "Guam killer" because it can target the key U.S. military base in the South Pacific. A newer anti-ship version of the 2,400-mile range DF-26 capable of maneuvering and precisely hitting an ocean-going ship also was disclosed recently by Chinese state media. The Trump administration announced last month that Russia has until Feb. 2 to return to compliance with the 1987 U.S.-Russia INF treaty that limits deployment of ground-based missiles with ranges of between 300 miles and 3,400 miles. After the Saturday deadline, the administration is expected to begin the process of formal withdrawal with six-month notice required under the treaty. 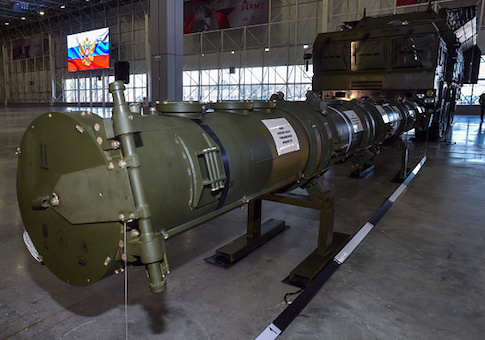 The Russians violated the treaty in developing, testing, and deploying significant numbers of a new ground-launched cruise missile called the SSC-8. Despite more than 30 meetings with Russian officials seeking a return to compliance, Moscow refused to get rid of the illegal missiles, the State Department has said. Moscow denies the SSC-8, called the 9M729 missile by Russia, is an INF violation and has countered U.S. claims by alleging that American target missiles used in missile defense tests violate the treaty. The INF treaty, however, does not cover target missiles. Russia also has claimed U.S. missile defense interceptors planned for deployment in Europe will violate the treaty. The treaty does not cover missile defense interceptors. In Beijing Thursday, talks between U.S. and Russian negotiators failed to resolve the dispute over Russian treaty violation. The commission report states that the administration identified China's exclusion from the INF and its development of large numbers of intermediate-range nuclear and conventional missiles as a key reason for the planned INF treaty withdrawal. In April, the new commander of the Indo-Pacific Command, Adm. Philip Davidson, said he favors jettisoning the INF treaty because of China's large missile forces. "In the Indo-Pacific, the absence of the INF Treaty would provide additional options to counter China’s existing missile capabilities, complicate adversary decision making, and impose costs by forcing adversaries to spend money on expensive missile defense systems," Davidson told the Senate Armed Services Committee. "I believe the INF treaty today unfairly puts the United States at a disadvantage and places our forces at risk because China is not a signatory," the admiral added. President Trump said in October that Chinese intermediate-range missiles are outside the treaty and that Russia has failed to comply with treaty limits. "Russia has not, unfortunately, honored the agreement, so we're going to terminate the agreement, and we're going to pull out," Trump told reporters after a rally in Nevada. "We'll have to develop those weapons, unless Russia comes to us, and China comes to us, and they all come to us and they say ‘let's really get smart and let's none of us develop those weapons,'" he added. "If Russia's doing it, and if China's doing it, and we're adhering to the agreement, that's unacceptable." The report states that treaty withdrawal could assist American-led security efforts in Asia. "One of the main rationales for withdrawing from the INF Treaty would be to offset the advantages China derives from its large missile arsenal and thereby help deter aggressive actions by Beijing," the report said. Also, U.S. missiles would provide lower-cost defenses than those provided by more expensive ships and aircraft. "Advocates of leaving the INF Treaty point out that missiles would force China to focus on destroying more targets in a conflict, thus diluting the amount of firepower the PLA could devote to any specific target," the report said. "U.S. missiles could also potentially be mobile, hidden, and dispersed throughout the territories of its allies and partners—for example in the Ryukyu Island chain in Japan’s southwest or in the jungles of the Philippines—all of which would complicate Chinese military planning." Those opposed to leaving the treaty say doing so would spark a regional arms race, and that current sea-based and air-launched missiles are sufficient to deter or strike Chinese forces. The report argues that pulling out of the INF treaty might undermine efforts to coax China into arms control talks. China has refused for decades to engage the United States in arms control discussions over concerns the talks will undermine the deterrent value of its weapons. A senior U.S. Strategic Command official said last year that U.S. plans to build small nuclear weapons includes missiles designed to counter both Chinese intermediate-range missiles in Asia and Russian systems in Europe. New U.S. missiles targeting China could be deployed in Japan, Australia, Philippines, or Guam. The report also said Russia might deploy intermediate-range missiles near China once the INF treaty is gone and that could benefit the United States by undermining growing strategic ties between Beijing and Moscow. According to the report, China's arsenal of ground-launched missiles is the largest and most diverse in the world and included more than 2,000 ballistic and cruise missiles. About 95 percent of all the missiles would violate the INF treaty if China were a signatory to the 1987 treaty. "China’s military, the People’s Liberation Army (PLA), devotes an entire service, the PLA Rocket Force, to operating those missiles," the report said. "Beijing’s INF Treaty-noncompliant missiles include some of its short-range (between 500 and 1,000 km or 310 and 620 miles), all of its medium-range (between 1,000 and 3,000 km or 620 and 1,860 miles), and all of its intermediate- range (between 3,000 and 5,500 km or 1,860 and 3,410 miles) ballistic missile variants." China's ground-launched cruise missiles also would violate INF. Most all of China's missiles are dual-capable, nuclear or conventionally-armed weapons, and large numbers of increasingly accurate conventionally-armed missiles would be banned under INF. The conventional missiles would be used to attack regional allies, such as Taiwan and Japan, and U.S. regional military bases in a future conflict. "The sheer number of Chinese missiles and the speed with which they could be fired constitutes a critical Chinese military advantage that would prove difficult for a regional ally or partner to manage absent intervention by the United States," the report said. "China has also already demonstrated a willingness to use its missile capabilities to intimidate and coerce an opponent in scenarios short of war, such as in the 1995–1996 Taiwan Strait Crisis, when Beijing fired missiles into the waters off of Taiwan. The missiles China fired during the crisis were DF-15 short-range ballistic missiles that would be banned by the INF Treaty." China's Foreign Ministry spokeswoman, Hua Chunying has said that the United States was "totally wrong" to point to China's missiles during the treaty withdrawal debate and should "think twice before pulling out." "The Chinese government has also officially stated its opposition to Beijing joining the INF Treaty," the report says, noting Hua's comments on opposing the multilateralization of INF. Chinese military experts that frequently reflect official Beijing policy have warned in state-run media that U.S. INF withdrawal would signal a more aggressive nuclear posture and undermine stability. The Chinese also fear that without the treaty, U.S. military forces will deploy ground-launched missiles in Asia, and threatened to further build up Chinese missile inventories in response. Shi Yinhong, a professor of international relations at Renmin University, stated that in response to the deployment of U.S. INF-range missiles in Asia, "the development of Chinese missiles is likely to rapidly accelerate."